Age 55 of Bolingbrook and formerly of Delano, Minnesota, passed away Thursday, March 28, 2019 at Amita Health Adventist Medical Center in Bolingbrook. Born September 8, 1963 in Watertown, Minnesota, Peggy Mae is a daughter of Genevieve (Schaust) Farniok and the late Ambrose William Farniok. She was raised and educated in Delano, Minnesota and graduated from Delano High School with the class of 1982. Following graduation Peggy went on to work for the John H. Harland Company for over twenty-five years. Her employment would have her relocate to California, and she would eventually settle in Bolingbrook. During that time she met and would go on to marry David Romer on May 23, 1987 in Delano. Together Peggy and David made their home and raised their two daughters. 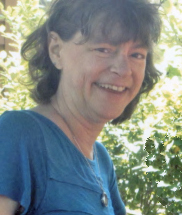 Peggy was a member of St. Francis of Assisi Catholic Church in Bolingbrook and in her free time enjoyed cooking, baking, gardening and helping out with the yard. She was known for her love of chocolate and finishing her sudoku puzzles, but her lasting memories will always be the love that she had for her family. Survivors include her mom, Genevieve and her husband, David; two daughters: Megan (Kevin) Staley and Leah Romer; three grandchildren: Anthony Romer and William and Rachael Staley; thirteen brothers and sisters: Jane (Dennis) Sticha, Judy (Tom) Farniok, Kathy (Erik) Farniok, Bobby (Shari) Farniok, Rita (Lance) DeTrude, Mark (Kay) Farniok, Wanda (Mike) Vanderlinde, Carmen (Ronald) Swartzer, Jean (Donny) Romer, John (Kim) Farniok, Wendy (Ned) Schroeder, Danny (Traci) Farniok and Billy (Maren) Farniok, as well as numerous nieces, nephews and cousins. Peggy was preceded in death by her father, Ambrose; granddaughter: Alexis Staley; niece: Stacy Vanderlinde, and brother-in-law, Allen Swanson. Per Peggy's wishes, cremation rites have been accorded. A Mass of Christian Burial will be held on Thursday May 2, 2019 at 11:00 a.m., in the Parish of Maximilian Kolbe-Saint Peter's Catholic Church, 204 River Street S, Delano, Minnesota 55328.